She is actually one of the most sought-after actresses in the Nigerian movie industry. Since Oge Okoye rose to stardom few years ago, she has been the toast of movie buffs, including directors, producers and marketers. However, her teeming fans, who have not seen her in new flicks lately, have been bombarding http://nollywoodgists.com with text messages and phone calls concerning the whereabouts of their favourite star. According to some of the fans, since she got married and gave birth to a baby sometime last year, much has not been heard about her again. In fact, some of them who claimed they hitherto saw her at night clubs noted that it's been long they saw her last. 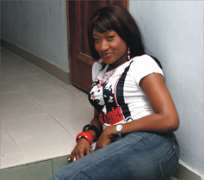 One of the text messages sent tohttp://nollywoodgists.com, “why have we not been seeing Oge Okoye in movies again? Is it that her husband doesn't want her to continue with the job? Please we want to know what is happening to her. Meanwhile, efforts by http://nollywoodgists.com to reach the actress on phone has so far proved abortive as her mobile phone was not going through. is she still in America? Do you really missed her?